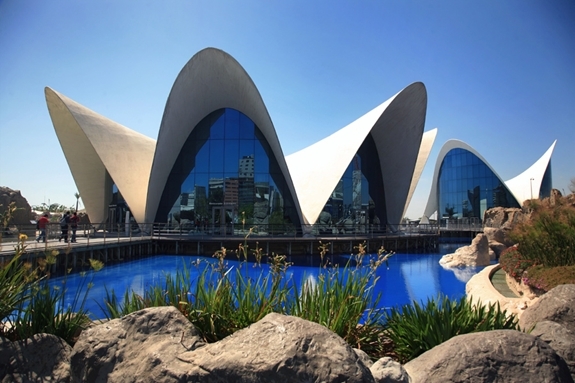 I posted a sneak peak to the Ciudad de las artes y ciencias (City of arts and science) in this post. I think this was the highlight of the trip to Valencia for me, I was soo fascinated by this amazing architecture! It’s sort of spacey and fairytale’ish and different and outstanding things always fascinate me. This was no exception. It’s situated a little outside Valencia city centre, and covers a big area with these cool white strange buildings. It was built from 2006 to 2008. 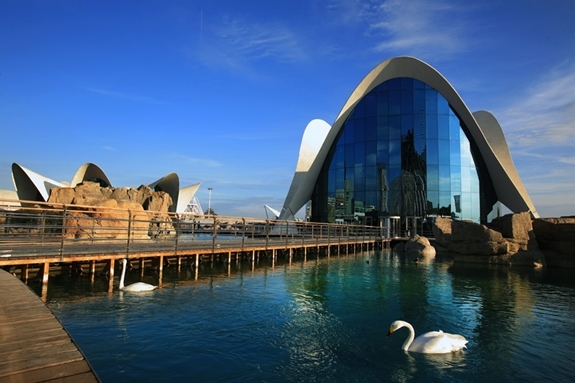 El Museu de les Ciencies Principe Felipe, an interactive science museum resembling the skeleton of a whale. Big building of three floors containing “the legacy of science”exhibition of researchers such as Ramon y Cajal, Ochoa and Dausset. “The chromosome forest” showing the sequencing of human DNA, “Marvel Superheroes exhibition”, “The Space Academy”. L’Umbracle, a landscape walk with different plants, and palm trees. L’Oceanografic, and open-air oceanographic park. Apparently the largest oceanographic aquarium in Europe! And it’s AWESOME! Deserves a post of its own! It's built in the shape of a water lily. Isn't this very cool? Definitely worth a visit if you go to Valencia! How incredible! I am a huge fan of architecture and this is such an amazing work of art. Thanks for sharing photos - I don't think I'd ever seen it before! I agree! I love things that are just different, and this bunch of buildings is incredible! Så utrolig flott! Det ser nesten litt futuristisk ut. Sånn fremtiden ser ut?